Dental implants can rejuvenate both your smile and your oral health. Implants are needed when people lose teeth due to injury or disease. People who have lost teeth might feel too self- conscious to smile or talk. Additionally, biting irregularities caused by tooth loss can have a negative effect on eating habits, leading to secondary health problems like malnutrition. By replacing missing tooth roots, dental implants provide people with the strength and stability required to eat all the foods they love, without struggling to chew. Dental implants also stimulate and maintain jaw bone, preventing bone loss and helping to maintain facial features. People by regular brushing, flossing, and checkups are able to maintain natural smiles for a lifetime, but sometimes a tooth (or a few teeth) are lost due to injury or disease. People who have lost teeth might feel too self-conscious to smile or talk. Additionally, biting irregularities caused by tooth loss can have a negative effect on eating habits, leading to secondary health problems like malnutrition. By replacing missing tooth roots, dental implants provide people with the strength and stability required to eat all the foods they love, without struggling to chew. Additionally, dental implants stimulate and maintain jaw bone, preventing bone loss and helping to maintain facial features. Dental implants can rejuvenate both your smile and your oral health. 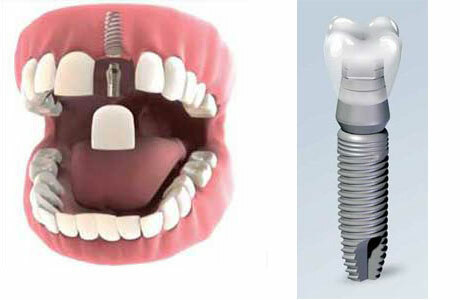 Dental implant procedure is a form of prosthetic dentistry. Prosthodontists are well trained in implant dentistry. They make sure the success of dental implant procedure. It is very important to schedule a consultation with your Prosthodontist at Stoma Advanced Dental Care before the implant surgery to determine if implants are right for you. Dental implants are a permanent and appealing solution to replace missing or extracted teeth. These are metal device made of titanium surgically placed in the jawbone where teeth are missing. They replace the roots of missing teeth and support single crowns, large bridges and dentures. State-of-the-art technology makes it possible for these replacement teeth to look, feel and function like natural teeth. An implant is a synthetic tooth root in the shape of a post that is surgically placed into the jawbone. The “root” is usually made of titanium the same material used in many replacement hips and knees, and a metal that is well-suited to pairing with human bone. A replacement tooth is then fixed to the post. These teeth are more stable and feel more like natural teeth. The entire implant process is performed over 2-3 months. The first part of the process is to install the implant itself, where a screw is placed into the jaw bone. 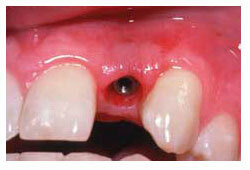 An incision is made in the gum so that the implant can be inserted. Multiple implants can be placed at once if necessary. After the implants are placed the gums are sutured. During this healing time a temporary crown is installed. After the implant has healed it is time to place an abutment on the implant. The abutment serves as the base for your new tooth. Once this is placed an impression of the abutment is taken and is used to create your permanent restoration. Once the restoration is completed you have to return to the clinic to attach the restoration permanently. Your smile will look just like it used to, and after a short period of getting used to the implant it will feel just like one of your own teeth. You regain the ability to eat virtually anything and the confidence, knowing that teeth appear natural and facial contours are preserved. Maintain the space of surrounding teeth. With changes in technology Stoma Advanced Dental Care offers only one surgical procedure for most patients. We will, whenever possible, place the implant and the healing collar at the same visit. This will allow for the implant to integrate with the bone while the gum heals around the healing collar. Then, after the appropriate healing time, generally two to three months, we can start making your new teeth. CT Guided Implant Planning is a revolutionary treatment planning enabling us to transfer oral planning into the mouth with unrivalled accuracy and ease. 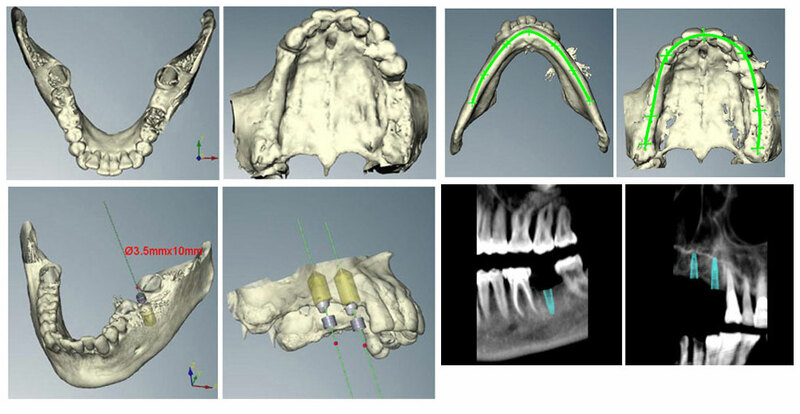 The implant guide software enables us to carry out the entire treatment planning extra-orally using a Virtual 3D model of the patient jaws and transferring this into a surgical template there by making the entire process of implant placement, fast and minimally invasive ( flapless).Its guided surgery components combined with a customized surgical template guides our drills and we deliver for the result we had planned. Since the final position of the implant is known prior to the actual surgery, the restoration to be given on the implant can be planned in advance. Under local anaesthesia, the first step for many implant procedures is the exposure of the bone where the implant is to be placed. This is followed by placement of the implant onto the exposed jawbone. Implants that are placed on the bone are called endosteal implants and are made of titanium, or a titanium alloy, because this metal does not adversely interact with biological tissue. After placement of the implant, a cover screw is put in and the wound is closed with stitches and allowed to heal. In general, placements in the lower jaw need about three months to heal, while placements in the upper jaw need about six months to heal. After healing, in a second surgical procedure, the implant is uncovered, the cover screw is removed and a healing abutment or a temporary crown is placed. Temporary dental crowns are generally used for aesthetic reasons. Both healing abutments and temporary crowns allow the tissue around the implant to be trained to grow around the final tooth prosthetics. After about two months, the soft tissue will be healed to receive the final prosthetic tooth. Impressions are taken to make a custom abutment that takes into account the shape of the neck of the implant. The prosthetic tooth is sometimes attached to a gold cylinder that can be screwed into the abutment or directly cemented onto the abutment. This multi-stage process, where the two surgical procedures are separated by a lengthy healing time, has proven to provide excellent stability in the final implant. Single step surgical implants are available, but skipping the healing step often loses some stability of the final implant. First implants, which looks like screws, is placed into your jaw. Over the next 2-6 months, the implants and the bone are allowed to bond. During this time, a temporary teeth replacement option can be worn over the implant sites. Occasionally, a second step is necessary to uncover the implants and attach extensions. These small metal posts, called abutments -- foundation on which new teeth or bridges are placed. Stoma Advanced Dental Care also offers a single step procedure where an implant already has the extension piece attached. But your periodontist at Stoma Advanced Dental Care will advise you about what is best for you. If all of your teeth are missing, an implant-supported full bridge or full denture can replace them. Dental implants will replace both your lost natural teeth and some of the roots. Dental implants are designed to be long lasting, comfortable and stable, allowing you to retain a more natural biting and chewing capacity. In addition, implant-replace some of your tooth roots thereby preserving your jaw bone. Dental implants integrate with your jawbone, helping to keep the bone healthy and intact .With conventional dentures, the bone that surrounds the tooth roots begins to resorb (deteriorate). Dental implants are like your own teeth and will require daily clean and plaque- free, brushing and flossing. Periodic follow-up visits should be scheduled to monitor your implant, teeth and gums to make sure they are healthy. Stoma Advanced Dental Care uses a variety of techniques to regenerate the lost support in case the jaw bone has atrophied or reabsorbed, which means that the quality of bone is not suitable for placement of dental implants. In these situations, most patients are not candidates for placement of dental implants. We at Stoma Advanced Dental Care conduct a dental/radiographic examination by a special CAT scan to see the status of your jawbone. A dental/radiographic examination is conducted by a special CAT scan of your jawbone. Over a period of time, the jawbone associated with missing teeth atrophies or is reabsorbed. Traumatic extractions, periodontal disease or injuries can also damage the implant site. This often leaves a condition in which there is poor quality and quantity of bone suitable for placement of dental implants. Today, we have the ability to grow bone where needed. Bone is either obtained from a tissue bank or your own bone is taken from the jaw. In addition, special membranes may be utilized that dissolve under the gum and protect the bone graft and encourage bone regeneration. This is called guided bone regeneration or guided tissue regeneration. This not only gives us the opportunity to place implants of proper length and width. Stoma Advanced Dental Care offers bone grafting. Bone grafting can repair implant sites having inadequate bone structure due to previous extractions, gum disease or injuries. The bone is either obtained from a tissue bank or your own bone is taken from the jaw, hip or tibia (below the knee.) Sinus bone grafts are also performed to replace bone in the posterior upper jaw. In addition, special membranes may be utilized that dissolve under the gum and protect the bone graft and encourage bone regeneration. This is called guided bone regeneration or guided tissue regeneration. These procedures are routinely performed in an operating room and require a hospital stay. Sinus Graft A sinus graft makes it possible for many patients to have dental implants. The maxillary sinuses are behind your cheeks and on top of the upper teeth. In some cases we perform a crestal sinus lift. Bone graft particles are inserted into the osteotomy (implant socket) that is created for the implant. This is a very conservative procedure and most patients have no added discomfort or side effects. If the sinus wall is very thin, a lateral sinus lift may be required. The sinus membrane is lifted and bone graft particles are inserted into the floor of the sinus. If upper jaw ridge and the bottom of the sinus has strong bone then implant placement is performed as a single procedure. If not then dental implants are placed after the bone becomes part of the patient’s jaw. Ridge Preservation is a technique used to restore the lost bone dimension when the jaw ridge gets too thin to place conventional implants. In this procedure, the bony ridge of the jaw is literally expanded by mechanical means. Bone graft material can be placed and matured for a few months before placing the implant. Ridge Augmentation is the procedure to correct ridge deformities of the upper and lower jaw when inadequate bone and tissue thickness makes it difficult to consider either a functional bridge or dental implant restoration. Soft tissue ridge augmentations is done by an incision is made to expose the bony ridge. A soft tissue graft is then obtained either from a suitable site in your mouth and/or a soft tissue substitute and inserted into the area. 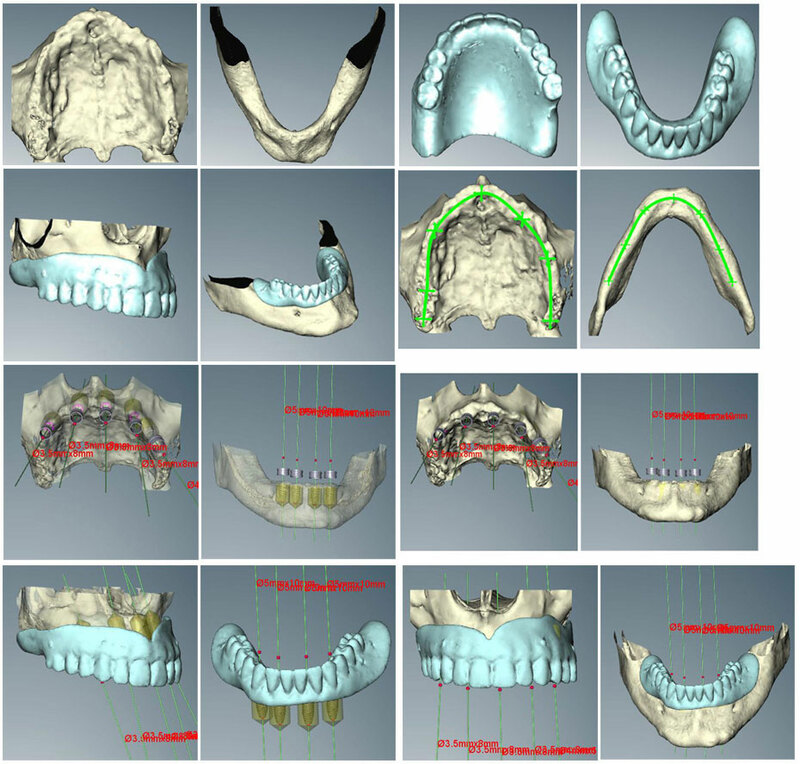 Hard tissue ridge augmentations are performed to recreate adequate bone dimensions prior to dental implant therapy. The hard tissue augmentation can also be done in combination with a soft tissue augmentation to simultaneously enhance the soft tissue at the deficient site. After the incision is made and the gum lifted away, the bony defect or bone substitute is placed in to build up the ridge. A membrane may be adapted over the bone graft based on individual defect morphology. Depending on defect size, an average bony healing and maturation time of 6-12 months is allowed before dental implants can be placed. This revolutionary dental implant system eliminates the need for bone grafting altogether. The Zygoma System is a graftless dental implant system where the implant is directly embedded in your cheekbones (medically referred to as Zygoma). This approach is on par with other advanced techniques like teeth-in-an-hour or keyhole placement. Your total treatment time could be as low as a week or two and likewise your healing would be much faster. As per case requirement we use this system in our clinic. If provisional restorations were placed along with the dental implant, it will be important to clean them as you would to your natural teeth to ensure the best possible healing and fusing of the implant. Failure to floss and brush is a leading cause of implant failure, and infection can occur if the implant and surrounding areas are not cleaned properly. Smoking is also attributed to high failure rates with dental implants and should be avoided following implant procedures.